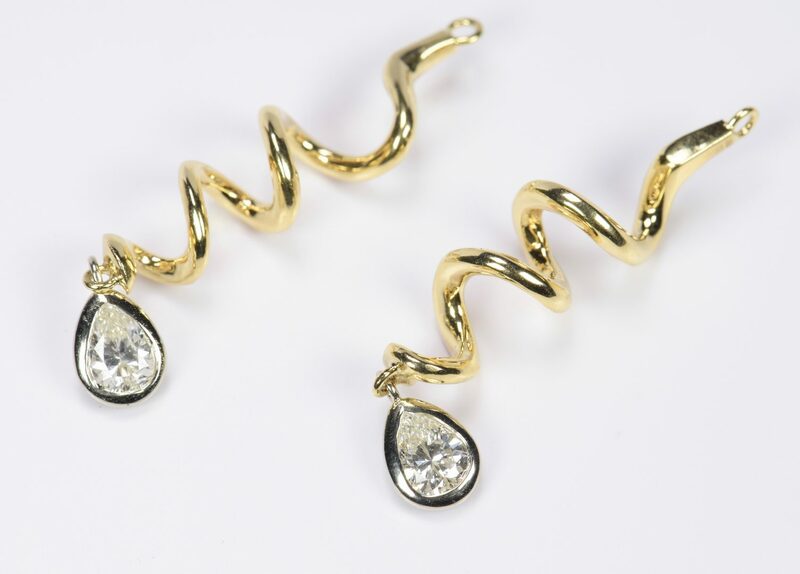 Pair diamond dangle earring jackets, one jacket containing pear shape brilliant cut diamond weighing approximately 0.51 ct, approximate color H-I and approximate clarity VSII and other jacket containing one pear shape brilliant cut diamond weighing approximately 0.46 ct., approximate color H-I, approximate clarity VSI, total diamond weight of approximately 0.97 ct. Diamonds are set in 14K white gold full bezel mountings and dangle from 18K yellow gold cork screw style mountings. Overall Length – 1 3/4"L. Gross weight total: 6.5 grams. Estate of Jane McKinnon, Lenoir City, TN. CONDITION: Very good, like new, condition.